The Marine Corps Air Station Beaufort Officer’s Wives’ Club Cookbook, A Taste of Freedom, caught my sister’s eye while visiting Beaufort, South Carolina. Within its pages Doug’s White Chicken Chili stirred her inner foodie. Perhaps Brooke Dunlap’s recipe appealed to the southerner within, connecting with her very distant bluegrass roots. Or, more likely it was the source of the recipe. One can only admire the “can do” attitude of a military wife. I’ve seen it first hand. Whatever is the case, I am happy my sister found this keeper and shared it with me for it is a memorable meal. So if you are inclined, give this one a try. 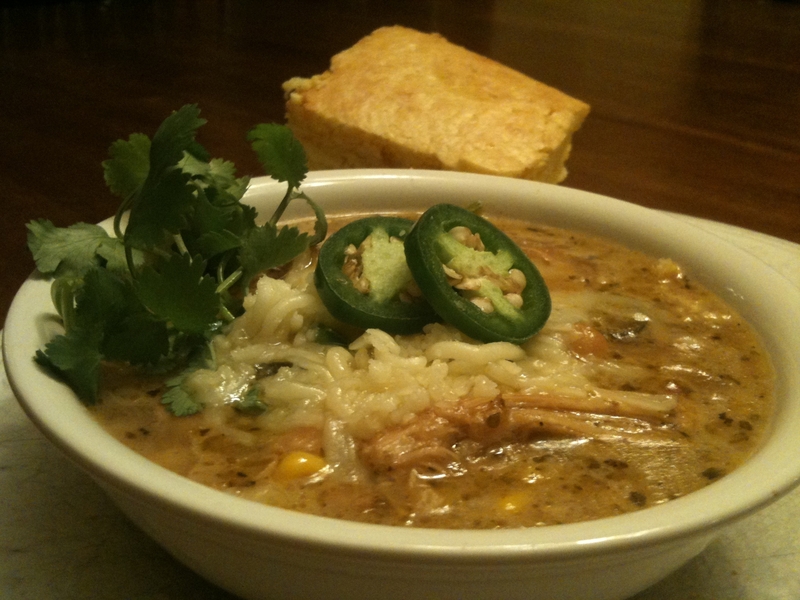 Perhaps Doug’s White Chicken Chili will become one of your favorites. I find that pan-searing the chicken breasts will give the chili the best flavor, but I bet shredded meat from a rotisserie chicken would yield fabulous results in a quicker amount of time. Although the amounts of onion, garlic and spices seem a lot, do not skimp. They are in perfect proportions. Be sure to follow the technique of “blooming” the spices in the sizzling olive oil because it infuses the chili with a wonderful flavor and gives this chili its character. If you like your chili on the thicker side, mash ½ can of the cannellini beans before adding to the pot. Heat olive oil in large dutch oven. Add onion and saute 5-8 minutes. Add garlic, oregano, cumin and ground ginger (and dried powdered mustard if using). Stir well and cook for 1 minute. Add broth, wine and bay leaf. Cook uncovered over medium heat until somewhat reduced. Add shredded chicken, beans, corn and Jalapenos. Simmer uncovered for 10 minutes. Mash 1/2 can of beans and stir in to thicken sauce. Add shredded cheese one handful at a time, stirring until it is well incorporated. Serve with cornbread, if desired. Cilantro, Shredded Cheese and fresh slices of Jalapenos make a great garnish by adding a nice pop of color. Original recipe by Brooke Dunlap found in The Marine Corps Air Station Beaufort Officer’s Wives’ Club Cookbook: A Taste of Freedom. Given to me by L. S.